Heat oven to 350°F (325°F for dark or nonstick pans). Grease or spray two 9-inch round cake pans. In large bowl, beat cake mix, water, oil and eggs with electric mixer on low speed 30 seconds, then on medium speed 2 minutes, scraping bowl occasionally. Divide batter between pans. Bake as directed on box for 9-inch rounds. Cool 10 minutes; remove cakes from pans to cooling racks. Cool completely, about 30 minutes. For easier handling, refrigerate or freeze cakes 30 to 60 minutes or until firm. Meanwhile, in small bowl, tint 1/4 cup vanilla frosting with red food color to make pink; place in resealable plastic freezer bag. Place 1/2 cup chocolate frosting in another resealable plastic freezer bag. Cut small tip off 1 corner of each bag. In medium bowl, stir together remaining vanilla frosting and chocolate frosting to make light brown frosting. Using serrated knife, cut off rounded portion of top of each cake to make level. Turn cakes cut sides down. Cut cakes as shown in template (template can be found under the Tips below). On tray, arrange cake pieces as shown in template, attaching pieces to each other and to tray with small amount of light brown frosting. Spread thin layer of light brown frosting over entire cake to seal in crumbs. Refrigerate or freeze cake 30 to 60 minutes to set frosting. Frost entire cake with light brown frosting. With pink frosting, pipe on blanket; spread with metal spatula to make smooth. With darker chocolate frosting, pipe number on blanket. Pipe on hooves; spread to make smooth. Pipe on mane and tail, leaving in long strands to look like hair. Attach mint for eye. Store loosely covered. 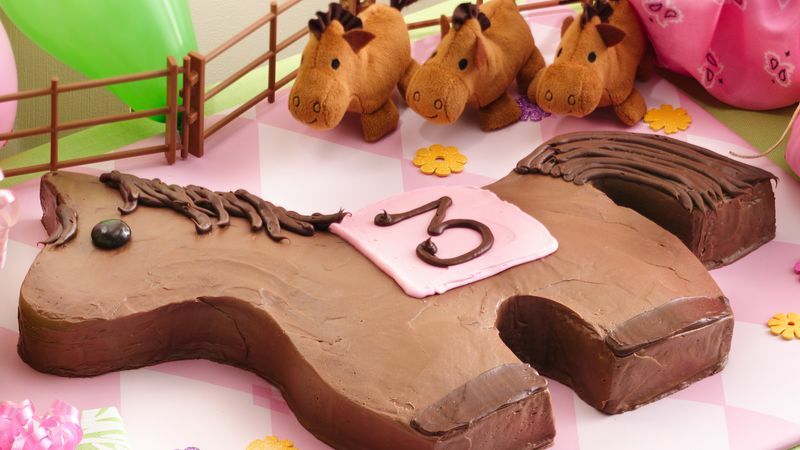 Get a party menu, prep guide, tips, party games, activities and more for a Pony Pals Birthday Party!